In a city of soaring real estate prices, New Yorkers love to hear the tales of people who found the Promised Land: a truly affordable apartment. Such places are the stuff of city lore: a three-bedroom in Manhattan that rents for less than $1,000 a month; a Lower East Side one-bedroom that cost a mere $2,000; an East Village co-op with maintenance charges of $545 a month. The children who grow up in these treasured homes, either rent-regulated apartments or limited-equity co-ops —which go for a fraction of what they are worth on the open market, to buyers who agree to a similar discount when they sell — can have an inside track. Some get their names on a waiting list for a home at the earliest opportunity. Others have the coveted right of succession. Holding onto such a New York City real estate prize into the next generation often requires foresight and its own kind of sacrifice, but those who have managed to do so say that the apartments can provide much more than shelter: their very affordability can shape the arc of a tenant or owner’s life. In a city where people move frequently, these tenants share the experience of living their entire lives in a single building. And while peers struggle to pay rent, they make professional choices uninfluenced by the high price of housing, but shaped instead by the home they’ve always had. In 2010, Josh Schaffner’s parents left their rent-regulated apartment in Inwood for a limited-equity co-op elsewhere in Manhattan. Mr. Schaffner, then 25, marched straight into the office of the Inwood property management company. For hours, managers pored over his file box, which was stuffed with years of bank statements, credit-card statements, tax returns and cellphone bills. Finally, management handed him his parents’ lease with their names scratched out and his written in their place. Rent for the three-bedroom apartment in an elevator building was less than $1,000 a month. Mr. Schaffner had anticipated the event for years. Knowing that eventually his parents would leave his childhood home, he had meticulously kept residency records so that he could meet the burden of proof to claim succession rights: The apartment had to have been his primary residence for at least two years, and he had to be a family member. But when the average rent for a three-bedroom apartment in Inwood is $2,550 a month, as it was in January, according to MNS, an apartment for less than $1,000 a month is a prize — and one that families fight to keep. The incentive to stay put offers a real financial reward: New Yorkers who had lived in the same apartment for more than five years as of 2012 paid a median monthly rent of $1,057, substantially less than the $1,444 paid by people who had moved recently, according to data provided by the Furman Center for Real Estate and Urban Policy of New York University. Parents living in limited-equity co-ops, such as Mitchell-Lama buildings, add their children to waiting lists years before they will need an apartment. And families in rent-regulated apartments plan for their children to claim the lease eventually. Mr. Schaffner’s sister now owns a studio apartment in a Mitchell-Lama limited-equity co-op on the Upper West Side. She bought it for $30,000 in 2012, a decade after she had begun putting her name on various waiting lists. But such opportunities are becoming rare, as more apartments are deregulated and as affordable-housing programs are phased out and the units converted to market rate. Between 2002 and 2012, the number of rent-regulated apartments in the city dropped by 8 percent, a loss of 87,820 units, according to the Furman Center. During the same period, six Mitchell-Lama co-op buildings, with a total of 3,432 limited-equity units, left the program. Mayor Bill de Blasio, who made the shortage of housing for working-class New Yorkers a campaign issue, has said he hopes to build or preserve 200,000 affordable units over the next 10 years. Even for those fortunate enough to be born into low-cost housing, waiting lists can last for years and the various programs have different qualification requirements. Rent-regulation comes with guidelines for succession, and limited-equity co-ops have their own rules as well. Many of these programs have income limits, with surcharges billed to high earners. In 1994, when Ms. Paparo was 23, her name came up. For less than $2,000, she bought an 800-square-foot one-bedroom apartment in the complex that had been her lifelong home, and where her mother still lived. What differentiates New Yorkers who live in such situations from their peers is that they can make career choices unencumbered by an outsize housing bill. In 2011, over half of the city’s renters paid at least 30 percent of income for rent and utilities, and 31 percent paid more than 50 percent, according to the Furman Center. Arismendy Feliz and his mother pay $580 a month in maintenance for the one-bedroom co-op they share in the Bronx. His mother bought the apartment for $250 in 1989 through a low-income housing program. Mr. Feliz, 30, bought half of his mother’s shares when he turned 18. Over the years, the co-op has become part of Mr. Feliz’s professional sphere. An artist, he now runs an artist collective called X Collective out of a vacant studio unit that the co-op owns but has been unable to rent out. For Ella Leitner, 40, the $12,000 Lower East Side one-bedroom that her parents bought for her in 1993 in the Seward Park Cooperative, then a limited-equity co-op, made a career in the nonprofit sector possible. While her friends spent their 20s hopping from apartment to apartment, Ms. Leitner lived next door to her parents’ two-bedroom, watching television with them on Friday nights. “It gave me the chance to have the career that I always wanted without having to worry about how I was going to pay my bills,” Ms. Leitner said. In 2003, Ms. Leitner married. Her parents retired and moved to Florida, transferring the shares of their apartment to her. She and her husband, who now have two children, combined the units, creating a spacious four-bedroom two-bath apartment with an open floor plan, an up-to-date kitchen and two balconies. Seward Park is now a market-rate complex. Of the few four-bedroom apartments available on the Lower East Side, the average price in January was $3.595 million, according to data provided by MNS. Resentment can run high among New Yorkers who pay market rate, particularly renters. Depending on how frequently the apartment has changed hands, an identical apartment in the same building can command a vastly different rent. Tensions can also arise within limited-equity co-ops, as some tenants want to preserve the programs while others see the potential gold mine that awaits them if they could sell their homes at market rate. Although some limited-equity programs are permanent, others, such as Mitchell-Lama co-ops, allow shareholders to remove their building from the program after a number of years, a process that includes a two-thirds majority shareholder vote. Nearly 1 million of the 2.2 million rental units in New York City are rent-regulated, according to the Furman Center. However, not all rent-regulated apartments are cheap. Some in less expensive areas can rival the neighborhood’s market rate. But in sought-after areas, the difference between a market-rate unit and a regulated one can be huge. There are far fewer limited-equity co-ops. In 2012 Mitchell-Lama, the largest limited-equity program in the city, had 66,500 such units. Mr. Miller points to rent regulation as a key factor driving up market-rate rents. With nearly half of the housing stock regulated, landlords charge a premium for what remains, he said. With stakes so high, landlords sometimes offer rent-regulated tenants six-figure buyouts. If they suspect a tenant doesn’t have a right to the apartment, they hire private investigators, challenge claims and take cases to court. Rent-regulated tenants who own a modest country house in, say, the Berkshires — affording it because they pay a relative pittance for rent — are often the targets. At the same time, New Yorkers who grew up in neighborhoods that were all but abandoned by landlords in the ’70s and ’80s now find themselves priced out of the very blocks their families struggled to improve. 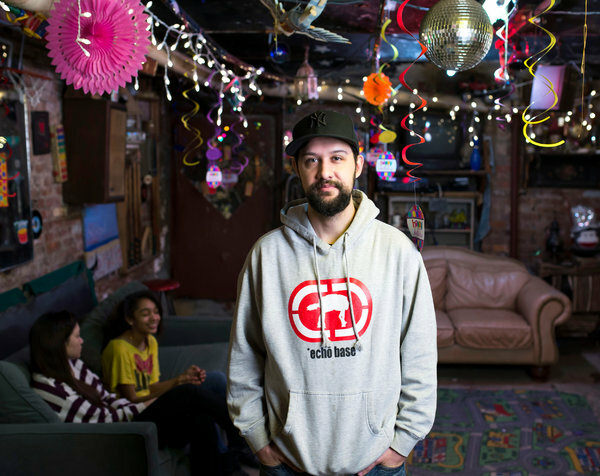 Marcel Torres, 31, has always lived in the same East Seventh Street building. In the 1970s, his grandmother led rent strikes against the landlord for failing to supply heat and maintain the building. Eventually the city took over the property, and in 1991, the tenants bought the building, each one paying $250 for an apartment. Mr. Torres shares an apartment with his father, his 12-year-old sister and his girlfriend; they pay $545 a month for maintenance. He hopes eventually to buy or rent a unit in the building, but worries it may not be easy on a struggling actor’s salary. Recently, apartments in the building have sold for close to $400,000, which is far below market rate for the East Village, but more than Mr. Torres can afford. “If it was back in the day, and we had known what we know now,” Mr. Torres said, “we would have kept every unit in the building.” Family members bought some, but not all, of the 24 units. 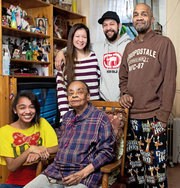 Several of Mr. Torres’s aunts and uncles live in the prewar building; their presence creates a kind of family compound. Mr. Torres remembers Christmas mornings when the halls would rumble as his cousins ran from door to door in celebration. The basement is lined with paintings, photographs and the skateboards that the Torres cousins rode in the streets as children. The basement community room, with well-worn sofas and a makeshift bar, was recently decorated for Mr. Torres’s grandmother’s 90th birthday. Living one’s entire life in the same place can be both comforting and unsettling, with some wondering what it would be like to live in another neighborhood. Her son learned to ride his bike in the same ball field where she learned, and childhood playmates still live nearby. When Ms. Paparo’s mother died last November, neighbors she had known since childhood provided solace. Yet if you never leave your childhood home, the quirks that irritated you as a child don’t leave either. When Mr. Schaffner was a boy, the kitchen sink gurgled without warning — making a vexing gassy sound that could be stopped only by turning on the faucet. Now, at 29, he finds that bubbling sound still annoys him. Similarly, when Ms. Leitner’s parents visit her at the Seward Park Cooperative, her father moves the sugar back to where he stored it when he owned the place. Last spring Mr. Schaffner’s fiancée, Offira Gabbay, joined him and his roommate in the Inwood apartment, giving up a cheerful one-bedroom in Brooklyn. The couple had spent months debating which apartment to keep, but there was really never much of a choice. Ms. Gabbay’s rent was $1,272 a month for a 450-square-foot space; Mr. Schaffner’s was less than $1,000 for a three-bedroom. As his 30th birthday approaches, Mr. Schaffner has begun to contemplate the possibility that he might spend the rest of his life in the apartment where his parents were married and where he grew up.